Appropriately, Hajek’s Gothic circle-of-infection is also the striking cover art for Heather Houser’s Ecosickness in Contemporary U.S. Fiction: Environment and Affect. Critiquing “an emergent literary mode,” Houser explores how “contemporary novels and memoirs deploy affect in narratives of sick bodies to bring readers to environmental consciousness”; her critical work “asks what happens when artists abandon quests for etiology as the driving force of their narratives,” a practice in contrast to the scientific pursuit featured in Robbins’s article (2). Novels and memoirs may reach wide audiences, but Houser’s deeply intellectual book is not for casual readers, speaking most specifically to literature teachers and ecocritics (Houser is an assistant professor of English at UT Austin). Back matter of Ecosickness is extensive: thirty-eight pages of notes, twenty-four pages of works cited, a comprehensive index. Houser’s attitude toward texts and criticism is flexible and open-minded, so this book seems like a conversation, albeit an erudite one between literary scholars speaking about “orthogonal discourses” and “imbrication” (4, 11). Houser’s opening chapter, “Ecosickness,” provides definitions and historical context for her later analyses of specific books. Ecosickness narratives are informed by marketing rhetoric, advocacy projects, the popular press, science writing, and visual art but “produce problems of literary form that the techniques of postmodernism, realism, nature writing, scientific communication, or activist polemic alone cannot neatly resolve,” and these narratives appeal to readers’ emotions using ethical stances on a spectrum from laissez-faire to nihilist, which may or may not move readers to political action (4-5, 8). Ultimately, Houser’s thesis is that ecosickness literature uses affect to politicize sick bodies and environments because art, not just science, is necessary for ecological and environmental engagement. A library of viruses must be complemented by a library of literature. Since the individual chapters of literary criticism in Ecosickness can stand alone, teachers working with this book might find it useful to move from Chapter 1 directly to “Conclusion: How Does It Feel?” prior to reading the four chapters of textual analysis. Here, Houser discusses two provocative arguments on “the perils of optimism”: the scientifically supported “optimism bias” and Americans’ cultural habit of positive thinking, identified by journalist Barbara Ehrenreich. This pervasive optimism prevents us from preparing for misfortune and allows us to ignore the harsher aspects of capitalism; Houser maintains that ecosickness literature can be an alternative to our national “narrative of triumphalism,” maybe bringing us face to face with reality (220). Because Houser’s close readings don’t clean up the “messy ethicopolitical emotions” in the books she reads, this concluding discussion clarifies the method of “interconnectedness” Houser employs (223, 224). Her closing chapter provides some insight into the “theory versus praxis debate” that has “misleadingly polarized ecocritics,” and briefly describes the work of two groups combining science and art to raise environmental consciousness, Critical Art Ensemble (CAE) and the Cultural Cognition Project (225). Houser’s concluding chapter is uplifting but unsentimental, moving smoothly among art, science, and policy, with a final shout-out to teachers and the power of literature to move readers to action. Between Chapter 1 and Houser’s conclusion lie discord, suspicion, detachment, disgust, wonder, and anxiety. More than any other affect, though, there is curiosity, Houser’s constant questioning of her own close readings, interpretations, and conclusions. Much of the book is in first person, and Houser frequently gives the reader a glimpse of her mind at work. For example, in writing about AIDS memoirs set outside the urban landscape in Chapter 2, Houser asks herself and the texts, “[W]hat emotions arise when AIDS experience is transplanted to unfamiliar landscapes in ecosickness narratives? How do these affects produce knowledge about contested environments? And how does this knowledge disturb conventional perceptions of endangered bodies and places?” (34). Houser constantly disturbs perceptions, including those she might lead herself or her reader to adopt. Chapter 3, “Richard Powers’s Strange Wonder,” includes a paragraph that sounds like Houser following her own train of thought. The paragraph concludes, “Wonder just might indicate a ‘readiness to find what surrounds us strange and odd; a certain determination to throw off familiar ways of thought,’ as Michel Foucault attests, but does it always provoke us to then don the mantle of involvement?” (93). Houser’s analysis of Richard Powers’s The Echo Maker is a challenge to narrow sentimental views of wonder as the inspiring emotion leading us toward solutions for environmental problems—toward, that is, caring. For Houser, ecosickness narratives are just not that easy; her reading of The Echo Maker’s disruptive “unexpected outcomes of narrative affect” builds a bridge from wonder to disgust and anxiety in the study’s final two chapters (116). Chapter 4, “Infinite Jest’s Environmental Case for Disgust,” begins by analyzing two visually disturbing environmental activism campaigns that arouse horror and discomfort in twenty-first century viewers, “address[ing] environmental catastrophe by eliciting disgust through monstrous hybridity and gory death” (120). Got your attention? That’s the whole point, according to Houser, who maintains that disgust is a potent moral affect, compelling us to focus on matters we would prefer to avoid thinking about, much less act upon. Moving from the visual to the literary, Houser interprets how David Foster Wallace’s Infinite Jest uses disgust to “motivate ethical relations” by intensifying readers’ consciousness of “’hopeless’ social and material conditions”(122). Like the grisly visual arguments that open this chapter, Wallace’s novel uses disgust as an attractive force, reminding readers that bodies, permeable and fragile, are a principal channel for environmental consciousness because we are as healthy—or sick—as our environment. Houser asks an obvious question (“Shouldn’t disgust engender detachment?”) and thoughtfully navigates toward the conclusion that negative aesthetics can map a surprising route to environmental engagement. Houser’s final analysis addresses anxiety, moving readers from post-World War II fears of technological total war to current dread surrounding biotechnologies creating genetic alterations. Ecosickness opens with “Carol White and Laura Bodey are under assault. […] Cumulative exposures to everyday products […] that were meant to beautify and sanitize their lives have instead poisoned them,” so I expected a book more focused on women and ecosickness than what actually followed (1). However, in Chapter 5, “The Anxiety of Intervention in Silko and Piercy,” Houser circles back to feminine environmental perspectives that challenge colonialism and sexism resulting in class privilege enhanced by swift and irrevocable changes brought about by technoscientific research. Leslie Marmon Silko’s Almanac of the Dead and Marge Piercy’s Woman on the Edge of Time are apocalyptic novels offering radically different readings of the biotech future. According to Houser, Piercy’s 1976 novel tells an optimistic story; the anxiety experienced by Piercy’s protagonist is relieved by “technologized agrarianism” which creates a utopia that “relieve[s] the burdens of alienated labor and reproduction to make time for self-exploration and pleasure” (169). In contrast, Houser reads Silko’s 1991 novel as “a totalizing picture of catastrophe, of scorched lands and bodies bleeding into each other” (201). Silko’s novel is a generically eclectic critique of American ecosickness at the end of the twentieth century, according to Houser, incorporating elements of the jeremiad and millennial environmental rhetoric to show how human activism can be attenuated by anxiety, leaving “the earth itself, not those who people it, [to bring] about revolution” (209). Houser is thorough and creative in her textual analyses, balancing science and literature as equally important for 21st century ecological and environmental understanding. She stresses that ecosickness fiction is not antiscience; on the contrary, the books she analyzes “approach scientific research as an avowedly shifting foundation for knowledge” in a time when humanists cannot opt out of scientific literacy. But she goes on to insist that “narrative illiteracy is no longer an option for the environmental and biomedical citizens we are called to be” (7). As scientists assemble a library of viruses, writers interpret for non-scientists the sicknesses of body and planet “through new metaphors, tropes, stories, and emotions” (222). Houser’s scholarship on the art of those writers is intellectually and emotionally challenging, messily engaging ugly and depressing topics. 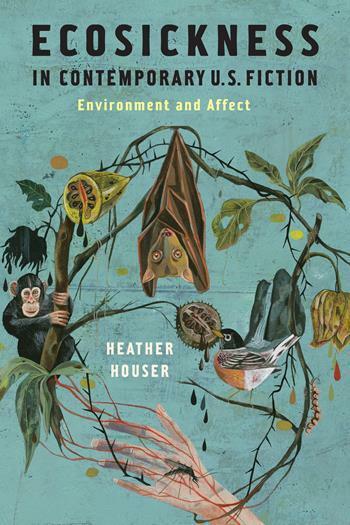 Like Hajek’s cover illustration, Houser’s study reminds us that the beautiful and the horrific coexist, but Ecosickness is, in Houser’s own words, “cautiously optimistic insofar as it illuminates contemporary writers’ attempts to ferry readers to environmental consciousness, even if on the raft of sickness and vulnerability” (223).